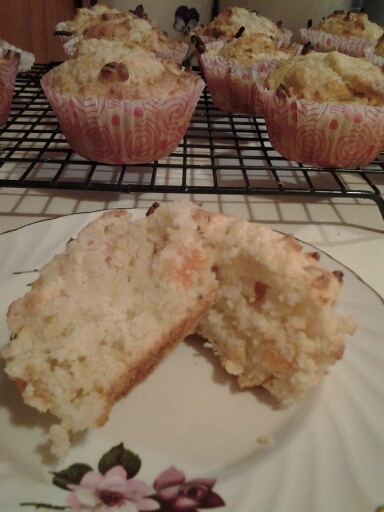 These are fruity coconut cream muffins. I had some coconut cream left over from the lamb & macadamia nut curry I made last night. So I thought, you know, I haven’t made muffins in ages. So I trawled the internet (and by trawled I mean a rather brief search) and slightly modified this recipe. Preheat oven to 180°. Line a 12 cup muffin tray with paper cases. In a bowl mix together all dry ingredients. In a separate jug or bowl combine all liquid ingredients. Add liquid to dry mix, stirring until just combined. Gently fold in apple and apricot. 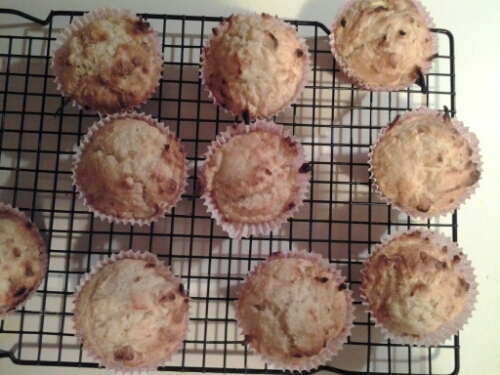 Divide mixture between muffin cups (I only made 10 because they looked a little small). Bake for 20min or until springy when touched. Cool in tray for 5min before removing to a wire rack.